Amidst the onslaught of bad news about antibiotic resistance, here is something good: Scientists have found a new class of antibiotics in soil bacteria, one whose mechanism could make it particularly resistant to resistance. More significant than this single new antibiotic, though, is how scientists found it. In the good old days of the early and mid-20th century, discoveries of new antibiotic came one right after another. Microbiologists were studying the microbes around us, looking for molecules that they naturally make to fend off their competitors. But now we've exhausted all of the low-hanging fruit, and there are few new antibiotics in the pipeline. The thing is, there are still plenty of bacteria around us that past microbiologists did not fully study. That's because an estimated 99 percent of all bacteria do not grow in petri dishes in the lab. In a paper published in Nature, scientists in the U.S. and Germany have come up with a way for coaxing "unculturable" soil bacteria to be grown after all. Ed Yong of Not Exactly Rocket Science deftly explains the process of how this new antibiotic, teixobactin, was discovered. [The iChip] just a board with several holes in it. The team fill the holes by collecting soil, shaking it in water to release any microbes, heavily diluting the sample, mixing it with liquid agar, and pouring the agar into the iChip. The dilution ensures that each hole, now plugged by a disc of solid agar, contains just one bacterial cell. They then covered the discs in permeable membranes and dunked the whole board into a beaker of the original soil. The microbes are constrained to the agar, but they can still soak up nutrients, growth factors, and everything else they need from their natural environment. In the study, the team tested 10,000 bacterial colonies for antibiotic properties about the bacteria that causes strep, yielding 25 candidates, of which teixobactin is the most promising. iChip unlocks the potential to test thousands, even millions, of bacteria we've never been able to study before. As for teixobactin, it's promising, but don't expect it to be a game-changer all by itself. It works by inhibiting the growth the cell walls in bacteria, a mechanism that is difficult (but not impossible!) for bacteria to evolve resistance against. But that also means teixobactin only works against bacteria without another membrane around those cell walls. 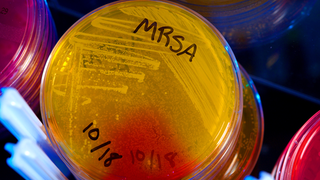 That includes bacteria like MRSA and TB, but not other worrisome ones like Klebsiella and E. coli, which have evolved a lot of resistance to existing antibiotics. Teixobactin will still have to be tested in humans for safety and efficacy. It will have to be easy to synthesize in large quantities and ideally ingestible rather than only injectable. There are many characteristics of a good antibiotic beyond just being able to kill bacteria. Don't expect teixobactin to be available for several years, and that's assuming it pans out. In the meantime, though, the search for new antibiotic candidates is on, more fiercely than ever.